Mohammed Olad Hassan, a correspondent for AP and the BBC, is said to be the eyes and ears and "in a real sense, the voice" of his country. CAMBRIDGE – The Nieman Foundation for Journalism at Harvard has selected Somali reporter Mohamed Olad Hassan to be the winner of this year's Louis M. Lyons Award for Conscience and Integrity in Journalism. Nieman Fellows in the class of 2011 selected Hassan, a senior correspondent and writer for the BBC World Service and The Associated Press, in recognition of his courageous reporting from a perilous region and for his enduring commitment to the people of Somalia. Hassan has endured repeated death threats, intimidation and a shrapnel wound from a mortar explosion near his home in 2007. In December 2009, he narrowly escaped with his life when a bomb exploded at a graduation ceremony he was covering, killing two dozen people, including a colleague who had just taken Hassan’s own seat. While a number of journalists and media professionals have been killed on the job in Somalia and others have been forced to flee the country, Hassan has persevered. Despite efforts by the government and radical insurgent groups like Al Shabab to silence the media, he has chosen to stay, citing his “desire to inform the world, to tell the truth and help bring peace and democracy to my own country.” Hassan’s peers recognize him as the voice of the voiceless in Somalia. Hassan started his career writing for the Xog-Ogaal newspaper in Mogadishu in 2001. 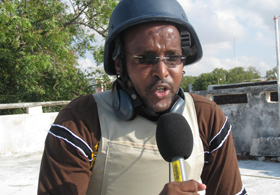 The following year he became the Somali Television Network’s chief Mogadishu correspondent and in 2003, he began reporting for the BBC World Service and The Associated Press. He has covered the conflict in Somalia, breaking a number of important stories. Earlier this year, he won the Parliamentary Press Gallery’s Speaker Abbot Award, presented annually in London to the journalist who is considered to have made the greatest contribution internationally to the promotion of parliamentary democracy. The Nieman class of 1964 established the Louis M. Lyons Award in honor of the Nieman Foundation curator who retired that year after leading the institution for a quarter of a century. The award honors displays of conscience and integrity by individuals, groups or institutions in communications. • Claudia Julieta Duque, a journalist who has covered human rights issues in Colombia for the past two decades. She has reported on massacres and disappearances, documented the recruitment of children in Colombia’s armed conflict and exposed the infiltration of right-wing paramilitary groups into government institutions. Because of her work, she has been a victim of intimidation, kidnapping, death threats and illegal surveillance – all carried out by the Colombian secret police, the Departamento Administrativo de Seguridad (DAS). Duque was forced into exile three times between 2001 and 2008. • Ahmad Zeidabadi, an Iranian journalist who has been arrested multiple times for his writing and is currently serving a six-year sentence in a prison near Tehran. His most recent arrest followed the Iranian presidential election in June 2009. He was held for 35 days in solitary confinement and beaten badly during interrogations. His latest prison sentence includes five years of internal exile in the city of Gonabad and a lifetime ban on all social and political activities. Zeidabadi had been writing for Roozonline, a Web-based daily published in Europe, before his arrest. James Fallows, a national correspondent for The Atlantic, will deliver the keynote address during the Nov 18 ceremony honoring Hassan. Fallows has worked for the magazine for more than 25 years, based in cities across the United States and Asia. A Harvard College graduate, Fallows was president of the student newspaper, The Harvard Crimson. He also received a graduate degree in economics from Oxford and was the founding chairman of the New America Foundation. I here would like to extend my deep hearted congratulation to Mohamed Olad Hassan who received an international honour based on merit and because of his service and sacrifice to the Somali people in one of the most dangerious and volatile areas in the Globe, simple thinkers may ask themselves live in such a danger but journalists are spritual soul. I am very much delightful with the selection of Somali reporter for rewarding the main task Mr. Olad and am thankful to Almighty God secondly Nieman foundation for the constant encouragement to Somali reporters like Mohamed Olad Hassan who reported the accidnets during the precarious situations in Somalia, where there is danger of human life. I say Nieman foundation 'continue your efforts to global reporters'. I wish and Pray that SOmali will be peace and stable in the near future. I would say Olad keep up the good work and would say to Nieman giver your awards to those who deserve like Olad - it is very kind of you.